Finally made it back to Shambala today (Sat, Aug. 6th, 2016), with a fair amount of trepidation. 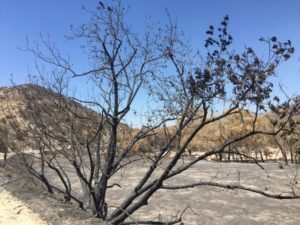 Recently, a massive fire burned for several days, scorching the land all around the Soledad Canyon preserve. Miraculously, all the animals and a handful of brave people who stayed throughout the blaze, were unhurt. The fire had burned right up to the edge of the compound. We expected that animals (and humans) would be suffering from smoke inhalation, and possibly heat stroke. At the least, we were sure that the more than 30 big cats would be anxious, fearful or agitated. As we turned onto Soledad Canyon Road, a pungent, burnt moss smell filled our noses. Within a half mile, the rolling hills touched by light green changed to scorched and barren. Blackened hillsides, trees turned to standing charcoal skeletons, charred and abandoned campsites— the landscape resembled a post-apocalyptic nightmare, all covered with a heavy, bluish haze. Did I mention the heat? At eleven am, it was already over 100 degrees Fahrenheit. 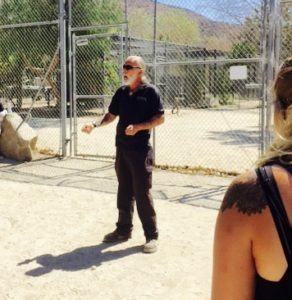 Chris Gallucci, the director at Shambala, met the group of “adoptive parents” at the gate. Chris is generally cheerfully gruff, with a ready, cinematic cowboy smile. But today he was downright grim. He had stayed on the property, along with helper Darby and the amazing Tippi Hedren, fighting the blaze alongside firefighters. They weren’t going to leave the animals, no matter what. They had defied evacuation orders, and protected Shambala with their lives. Usually Chris loves all questions about the cats, but today he just said “I’m not gonna talk about the fire right now.” We got it, and followed him inside the compound gates. One Saturday a month, a dedicated group of people who have chosen to “adopt” one or more of the cats living at Shambala, come and visit their babies. With the help of Darby and a couple of volunteers, you get to give each cat a treat (a large hunk of raw meat still on the bone) and hang out with the animals. The cats look forward to this ritual as much as the humans, if perhaps for different reasons. Shambala is unique, and completely unlike visiting a zoo. 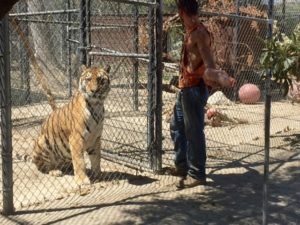 The animals are treated more like honored guests as opposed to caged objects for gawkers. Former actress, Tippi Hendren, star of Alfred Hitchcock’s “The Birds”, (still surpassingly beautiful in her eighties), has created a sanctuary out of love. The place is an oasis in the desert. But there is more. Sheer magnificence, obvious intelligence and nobility are a few reasons big cats are great to be around. But the feeling one gets from proximity to the cats is hard to categorize. Mysterious, subtle, ecstatic– I can only liken the experience to a state of high consciousness. Big cats are naturally in meditation. They are the Kshatriya of the animal world. Noble warriors of high spiritual attainment. Big cats radiate energy; high, pure, powerful energy. Being around lions and tigers feels a lot like sitting near an enlightened master. The molecular structure of the air palpably changes. Reality heightens; you are in the company of a perfected being. Even in captivity their regal nature is unmistakable. Big cats are a microcosmic example of the Divine, a piece of biological engineering that combines greatest beauty with maximum effectiveness. One cannot imagine a creator adding anything to them to make them any better. They are absurdly beautiful as well as the most efficient predators on the planet. Yet, there is a poignant quality as well. 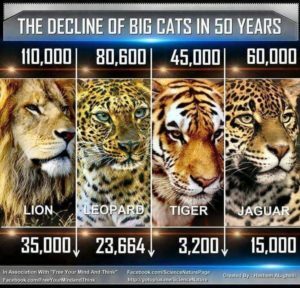 Lions, tigers, leopards, in fact ALL wild cat populations, are in rapid decline across the globe. The attrition is astonishingly fast. Some reports say that up to 90% of wild lions and tigers have disappeared in the last twenty years alone. Hunters killing lions is the moral equivalent of allowing people to go after Buddhist monks for sport. Only a monster of low consciousness would kill such a creature. Hunted nearly to extinction in the wild, big cats everywhere are in immediate danger. “Civilized” countries still permit trophy hunting, one of the most despicable and psychotic of all “sports”. The immense tragedy of this sets in when you are near the animals. That someone would find killing a lion or tiger “fun” is one of the many appalling realities of this world. The intrinsic irony here is that we have reached a historical moment when the pens are to protect the cats from humans, and not the reverse. Great cats were made to run free, and no one can escape the knowledge that penning them is most likely not their first choice. Nevertheless, at Shambala they have shelter, are well fed and have veterinary care. They are in safe, large, enclosures; not caged. 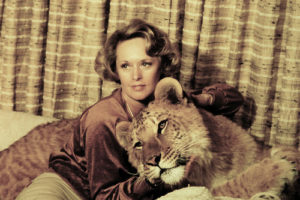 Tippi has rescued big cats from far and wide. Many come to Shambala after someone realized that a lion or a tiger wasn’t a great idea for a house pet. 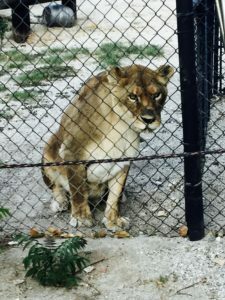 Michael Jackson’s lion, Sabu, now lives at the preserve, barely able to walk after the “Neverland Zoo” had his claws removed. There is a mountain lion living there that someone found under their porch, and with good sense, brought to Shambala. Tippi tells a story about a New York City man who shared his two bedroom apartment with a full-grown lion! Cougars, panthers, tigers orphaned by hunters… Tippi has taken them all. Once inside the preserve, we find the cats changed by the fire, but not in the way we expected. They are active, prowling, moving about in the intense midday heat. Not anxious or traumatized, the cats seem, well… HAPPY. A couple of them react to Darby as a house cat might, rubbing their heads on the fence near him, greeting him affectionately. Yes, they are getting food, but we’ve been here before at feeding time, and they were not like this. At first, we assume that perhaps they are still riled up from the danger, maybe adrenaline is still in their systems. 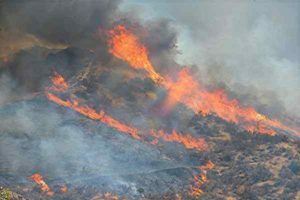 But Darby tells us that they were mostly calm during the blaze, except for when the Black Hawk helicopters were flying 400 feet overhead to make a water drop. The animals approach the fence playfully, making deep, guttural purrs. Alert and receptive, the legendary aloofness of big cats is all but absent. A couple of the lions, usually a little distant, make ready eye contact with us. They react to the visitors as welcome friends, rather than with the weariness of an objectified being. One of the lions does a loping dance back and forth along the fence, looking out with curiosity, and yes, smiling at everyone. After a moment or two of wonder, it becomes obvious that the big cats have bonded with the humans in a deeper way. Even with the exceptional care they receive, the animals clearly know that these people chose to protect them with their lives. There is no mistaking what we are seeing, the animals are showing appreciation. 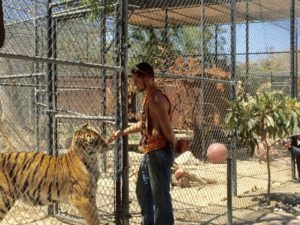 The humans and big cats at Shambala Preserve went through the fire together, and came out with a renewed understanding and love for each other. The close call with fire appears to have caused a tiny mutation to both human and big cat. Whatever ingrained, false ideas any of us hold that keep us believing that animals are less conscious, cannot understand, or feel less than humans do, eroded further. A chunk of ignorance separating us from other sentient beings on this blue planet also got incinerated during the seven days of raging fire. Forged in heat and danger, solidifying into trust, a new recognition had arisen between species. Wary friends became loved allies, and instead of loss and sadness, we found something miraculous uncovered by the flames.